I don’t usually write these kind of posts, but today I couldn’t resist myself. I am not an eloquent writer, but this is a heartfelt letter to a man who immortalized one of my favorite literary characters. When I opened my Facebook an hour ago I was hit with the news of Alan Rickman’s death. And I was overwhelmed. To many of you, he is your favorite actor, but to me, he is Severus Snape. 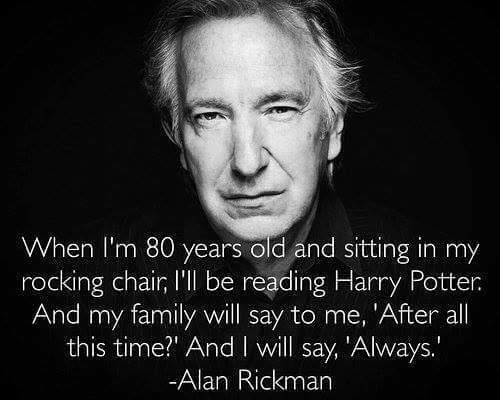 And hearing about his death felt like losing Professor Snape all over again. The first time was hard enough and this time it isn’t any easier. My journey with Harry Potter started when I was 14 years old. Over the years I’ve read the whole series innumerable times. For six and a half books I hated Snape. He went out of his way to make Harry’s life a living hell. Not to mention, he was pretty much Voldemort’s right hand man. Or so we thought. All that changed the moment when he was taking his last breath and whispered “Look … at … me …” to Harry. That is the moment my heart broke. It was also the moment when I fell in Severus Snape. From this point onwards, after hearing ‘The Prince’s Tale’ my love and admiration for Snape just grew. He was just a boy who fell in love with a girl. He was the boy who was bullied for not being the traditional definition of handsome. He was the man who loved a woman, a woman who loved his tormentor. Every time he saw Harry, he thought of James Potter. But his green eyes reminded him of his one true love, Lily. Severus Snape became the definition of true love for me. No matter what transpired, he loved Lily till his last breath. There are times when I feel, Lily wasn’t worthy of the man’s love. Snape lived for Lily and died to save her son. Harry may have been the protagonist, but Snape was the true hero. Dumbledore may have been the greatest wizard, but Snape was and remains to be the ‘Greatest Man’. This was probably the highest regard Harry could give to Severus Snape. Dumbledore’s death may have broken our hearts, but Snape’s death destroyed us. We may have hated him for most of the series, but when we fell in love with Snape, we never fell harder. You will be forever missed. Snape was better off with you.